50k from New Delhi just off NH 8 National Highway. The 27-hole course at the Classic Golf Resort was the first Jack Nicklaus course to open for play in India (Kalhaar Blues & Greens in Ahmedabad became the Golden Bear’s second Indian layout in 2012) when the Ridge, Valley and Canyon nines were unveiled in 1998. Set out in the foothills of the Aravalli Range, on the outskirts of Gurugram, the course is characterised by wide, rolling fairways and fast, multi-tiered greens with water coming into play at many of the holes. The Valley nine forms the back nine of the championship course and it’s on this circuit that many of the best holes are found. The 13th is a brute of a hole, playing uphill all the way from tee to green whilst the downhill 18th plays along a valley to a heavily contoured green full of breaks and borrows. The country’s most prestigious golf tournament, the Indian Open, was first held at the Classic Golf Resort in 2000 when local hero Jyoti Randhawa won the competition. The event returned to the club the following season and this time Thailand’s Thongchai Jaidee claimed the trophy. 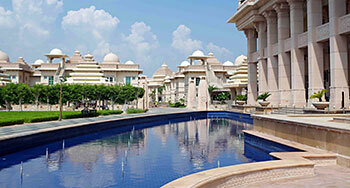 The ITC Grand Bharat might be the most opulent hotel you will find anywhere in India. This luxury retreat has been built on 3000 acres of secluded property at the foothills of the picturesque Aravalli Hills and only a 50-minute drive south from Indira Gandhi International Airport. A true oasis of tranquility! Their Classic Golf Resort is the first Jack Nicklaus signature course ever built in South Asia and is comprised of 27 holes (The Ridge, The Valley and The Canyon). Each course offers a variety of short and long holes, with plenty of bunkers, strategically-located water and undulating greens. You may not need your driver on most par fours as positioning off the tee is more important than distance. However you w ill find that your approach shots are paramount here as you are often faced with very narrow greens and ominous bunkers protecting them. I found the Ridge Course to have gentle rolling fairways with strategically placed bunkers. The Valley Course has more water that comes into play whereas the Canyon Course has more craggy views. I was fortunate enough to have Tinku as my caddy to guide me but was humbled by their Golf Professional Anil, who shot 1 under for his round. Anil assured me that there are no dangerous animals or snakes to contend with on the property but we did see plenty of peacocks strutting their stuff, as if to mock me. The whole day was a spectacular experience. My only negative is that the greens are quite small and a little on the shaggy side. Their greens fees are fair and they have plenty of reasonable suites to choose from starting at $390 USD per night including breakfast, golf or a 1-hour signature body treatment. However, if you are not the faint of heart then you might be interested in a Presidential. These two-storey 4000 square foot 2-bedroom villas come complete with their own private pool, a full time butler and rent for a mere $8,500 USD per night. You better get yr putting right here! Its got slopes,speed. Also, hone up yr bunker skills ! U gonna find lots of them !